When you’re thinking about cutting some funding for vulnerable children. 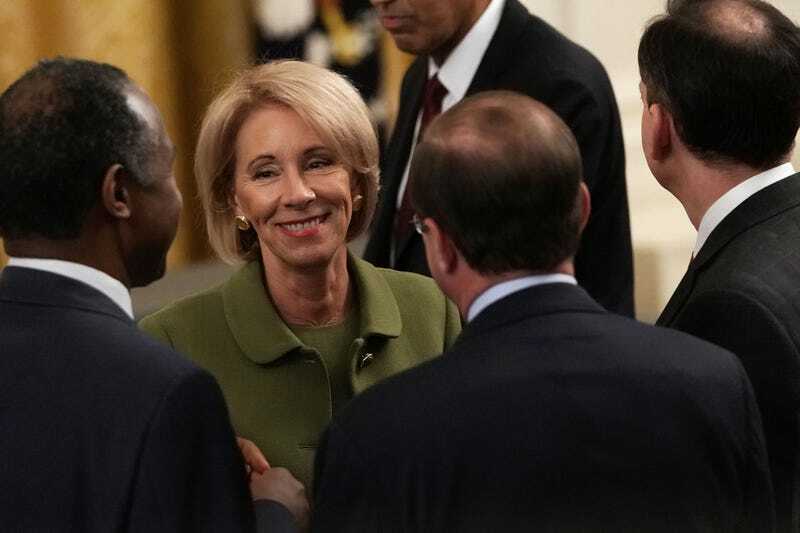 On Tuesday, Secretary of Education Betsy DeVos met with members of a House appropriations subcommittee to defend her department’s proposed budget for the next fiscal year. It was, like most of what happens in government, a ritualistic offering—the proposed budget is a proposal that reflects the administration’s priorities and preferences, not something that is going into effect immediately; the appearance is an opportunity for representatives to ask questions and for DeVos to give answers that are only sort of related to those questions. The budget that eventually goes into effect will only look a little bit like the one that DeVos and her department have proposed, and this was true even when Republicans controlled the House of Representatives during the first two years of the Trump administration. This was just one moment in the endless oafish square-dance of policymaking, a moment in which the two partners in the dance turn to face each other and take turns flailing and thrusting and mincing and generally acting like real idiots. There is no music playing. Or, without the metaphor: this was an opportunity for DeVos to demonstrate that she and her Department of Education would like to cut $7 billion—that is, roughly 10 percent of the department’s total budget—in spending on education. DeVos also proposed spending an additional $60 million on charter schools, but mostly this was about identifying which areas DeVos and the Trump administration thought were receiving too much money—programs designed to improve conditions at deteriorating or dangerous public schools, for instance, or grants that aimed to shrink class sizes and fund professional development for teachers. The proposal also involved eliminating the entire $17.6 million that the federal government contributes to the Special Olympics. “It’s unlikely that any of the major reductions, or any major proposals to boost school choice, are headed towards passage,” the Detroit Free Press notes. “Even with Republicans in the majority in the U.S. House the last two years, most of DeVos’s strongest proposals for cuts or spending were turned back.” With a Democratic House, they stand no chance. Again: majestic dance of failure; ritual and performance; outcomes that satisfy no one, forever and ever. That proposal was not adopted, either. Then, as now, the administration’s budget proposal was, while an obscenity on its merits, also perhaps best understood as a gesture, or as a rare example of the extravagantly cursed internet phrase “virtue signaling” in action. Betsy DeVos and the other ghouls in Trump’s Carnival Of Souls will not succeed in eliminating federal funding for the Special Olympics. It’s just important for them to get on the record about wanting to do it.